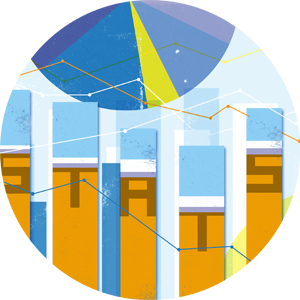 The Statistics Department offers a Doctoral Program with two different tracks that students can choose from: A Mathematical Statistics track and a Biostatistics track. Both tracks are designed to provide doctoral candidates with a firm foundation on probability theory, inference, and classical methodology. In addition, the theory and application of statistical computing, and graphical as well as computer based inference are integral parts of the core curricula. The Biostatistics track provides students the opportunity to focus on one important area of statistical research, namely on the methodology and application of statistics in the life sciences. There is no direct link between the Mathematical Statistics and Biostatistics tracks in the MSc and the Doctoral programs, respectively. That is, a student can pursue a MSc in the Mathematical Statistics track, and then a PhD in the Biostatistics track. All students must take an additional six courses chosen by the student and approved by the DGS. Three of these will complement and supplement the student's specialization area and research interests. STA 715 (Reading courses) may not be used to satisfy this requirement. The six electives must be chosen from among STA 612, STA 616, STA 621, STA 624, STA 626, STA 630, STA 635, STA 643, STA 644, STA 653*, STA 661, STA 662, STA 665, CPH 631, CPH 636, and CPH 664*. STA 695 will also be considered on a case by case basis. A course that is required for the selected track may not be used as an elective. In the following, typical course schedules for both tracks are summarized. Several alternative paths are possible. It is clear from the above track requirements that the only difference in required courses is between STA 702 and STA 709. However, in practice, students often choose to take both of those classes, one for the track, and the other as an elective. The residency policy at the University of Kentucky is described in the Graduate School Bulletin. Students must pass a uniform written exam over STA 701, STA 702, and STA 703 plus respective prerequisites. This exam will normally be offered at the end of May in the third year of the program. The uniform exam can be repeated once. A student can choose their advisor at any time. After completion of tract course requirements and successful completion of the written exam, students must also successfully complete an oral qualifying exam which is scheduled in consultation with the student's advisory committee. A significant part of this exam is to be a dissertation proposal. For details, see the Graduate School Bulletin.